Tuesday, April 16th at 6:30pm in Verona. Join us for food, fellowship and Bible Study as we study Miriam, a blessed servant, called to carry out an important responsibility and service to the Lord. She is also a perfect reminder to us that no one is too important to receive God’s discipline for our sin. The church is looking at a new logo design shown here. The committee is seeking input and anticipates it being presented to an upcoming congregational meeting in the future. How is your marriage? Would you like it to be healthier? God designed marriage and only he can improve the health of your marriage. Join us for a two-day marriage enrichment event September 20-21, 2019. The cost is $185 per couple and includes a traditional Spanish family-style dinner Friday evening & lunch catered by Olde Madrid of Racine, continental breakfast Saturday morning, and all enrichment sessions. Spend two days learning how to know each other better, appreciate each other more, gain trust, manage conflict, nurture intimacy and connect with each other intentionally – all in the light of God’s grace. The result? A healthier marriage. Space is limited, so register early. See the poster or brochure in our lobby or visit www.wels.net/marriage-enrichment for more information and to register. Space is limited. Please get the word to your flock as soon as you can. I thank Jesus for the privilege of partnering with you to teach the gospel. May Jesus bless your efforts to help couples glorify him in their marriages. We have done this run in the past. The outreach team sponsors this run. Our very ownElizabeth Strutz works at the library. PLUS our team won the team event last year, so we must defend our title! Class times can be scheduled at your convenience. 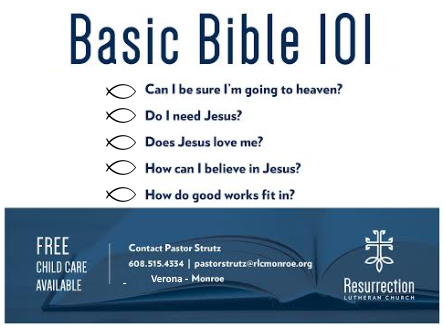 This is a no cost, no obligation basic Bible information course and will give participants a solid, foundational understanding of God’s Word. Classes meet for about one hour. Classes will be held at both Monroe and Verona campuses, and meet for about one hour. Additional class times can be scheduled at your convenience. Session one - Can I be sure I’m going to heaven? Session Two - Do I need Jesus? Session Three - Does Jesus love me? Session Four - How can I believe in Jesus? Session Five - How do good works fit in? 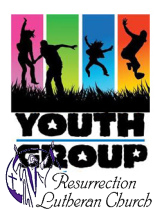 Youth Group Scrip Cards NOW ON HAND! If anyone from RLC Monroe is interested in purchasing cards, please e-mail Denise at reimer1@charter.net. The youth group thanks you in advance for your support! All of Wels from their mobile app. I am trying to create an online Cookbook of RLC recipes that you can share with friends and family on Facebook or via a website. 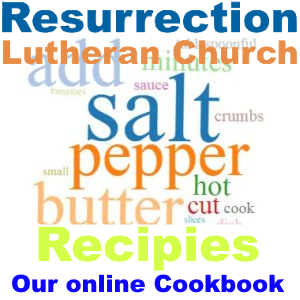 This cookbook will serve as an easy inreach / outreach ministry, we are after all a church that loves fellowship, a great meal and sharing the love of Christ. Megan and I had a whirlwind year of traveling in 2018! We enjoyed the encouragement from the Grow in Grace retreat in San Antonio in the spring and traveled to England and Germany for vacation at the end of the summer. England had been a dream trip for Megan, and I was able to show her the seminary where I studied in Germany. To get out into the community more, I joined a community choir which toured to Washington D.C. in the spring and sung with the Ann Arbor Symphony Orchestra this past December and January. Megan still works as the office administrator at a water environmental engineering firm in Ann Arbor. We are expecting our first child, a daughter, in early June! That good news has been paired with more difficult times as Megan`s grandmother passed away in November and in December my mother`s cancer that begun during my vicar year has return and spread. In all things, we cling to God`s gracious promises. We have really enjoyed our new church renovation for the past year and a half. I attended the Multi-Site Conference Pastor Strutz organized this past year, and we have begun discussions with two neighboring churches for the potential of increased ministry and outreach. I am excited and hopeful we can get something accomplished. I started a food drive canvas this past summer to support public housing near our church, and we had a great response from our neighborhood. We are planning on keeping that as a yearly outreach event. Although we are doing more outreach, unfortunately God has not blessed those efforts yet with more people joining our church through Bible 101. However, God does seem to be blessing our campus ministry efforts at Michigan. We are receiving synodical subsidy through the campus ministry committee, and our core group of students has almost tripled in four years. 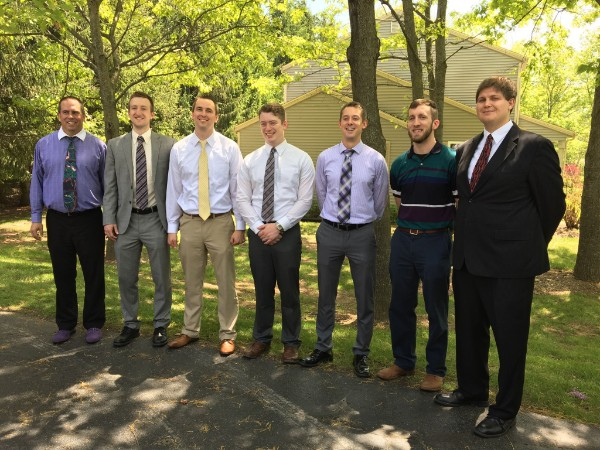 This past summer I began a Doctor of Ministry (DMin) program with a focus on preaching, along with some electives in New Testament. I have enjoyed the chance to get back to the classroom while still serving as a pastor. It brings me so much joy to hear all the blessings that have happened in Verona, Mt. Horeb, and Monroe since my time with you. 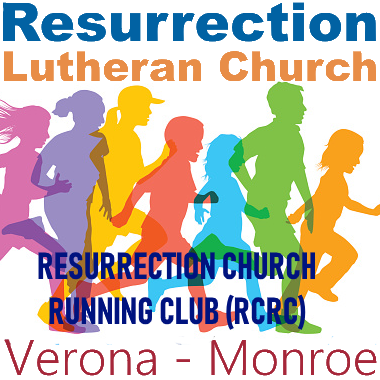 God`s continued blessings to you at RLC! Carissa teaches first and second grade at Loving Shepherd in Milwaukee, where I am also serving as a senior vicar during my last year of seminary. This was my home congregation growing up and we are living about 6 blocks from my childhood home. I get to preach about once a month, and have started a youth group. My Senior Thesis paper is basically wrapped up and now we are waiting for Call Day and Graduation. I`m also scheduled to go on an archaeological dig in Israel this June. The end of 2018 was sort of a whirlwind. My mom died from the cancer she had been battle for about 4 years on September 4th. Her mom, my Grandma, followed her this morning, as I write. She took a fall on New Year`s Eve Day, and I was the one to find her conked out on the floor. She went through hip surgery at age 90 and the surgery seemed to be successful. But after a miserable first day of recovery, she said she couldn`t take it, and then soon later she went into a deep sleep for basically a whole day before she died early this morning, January 7th. Our joy to see Grandma go home to heaven is far less than our sorrow. All things considered, I guess we are hanging in there. I was ecstatic to hear about Christmas at Resurrection and to see the article in Forward in Christ. 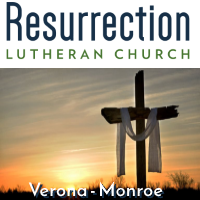 It was a privilege and joy to be in the middle of it with all of you at Resurrection Verona and Monroe. God`s blessings as you keep it going! God has also been very good to us at Risen Savior. We recently completed our building project, and the new sanctuary and education wing look amazing. The congregation has officially decided to move forward with a preschool, united behind the mission that the preschool will serve as an outreach arm of the church, connecting these young children and their families to their Savior. Lakewood Ranch is a fast growing community, and as such, there are many opportunities to proclaim Jesus to the people around us. We do that currently through our Mornings with Mommy program, our New Mover Outreach Team, our Community Gospel Share Team, and we look forward to doing that in the Summer of 2019 with our Summer-Long Music Camp. While there are challenges here, we give thanks for the many undeserved blessings God continues to give us at Risen Savior. RLC will always hold a special place in our hearts. We pray God`s blessings upon the ministry at RLC, and all the great people who are there! Our synod`s mission board must be OK with us sticking around here in Chattanooga, TN for a while seeing as we just purchased a home and moved out of our rental in early December. We`re glad we`re all settled in our new home now since we are expecting a baby this coming March. New baby, new home, new church. I guess we might as well try all of it at once. Living Hope continues to be blessed by God. We got to welcome 35 members to the Living Hope family on December 9. We called it our member commissioning service. About half of those members were our WELS core group and the other half are people we`ve met from all different backgrounds here in Chatt. We`ve got Bible Information Classes continuing with a handful of others and some prospects who continue to attend very faithfully. Just about every week now we see a new face come check out our worship at the Regal Cinemas movie theater. All we can do is pray that God keeps blessing us exactly how he already has. We look forward to having about 4 different mission teams visit us throughout this next year to help with canvassing and a possible summer camp. If any are on their way down to a Florida beach please don`t hesitate to contact us, we`d love to see you on your way! You`ll probably pass through Chattanooga. May God bless our shared efforts to reach others with The Good News. Two weeks later is better than never? This past May I graduated from Wisconsin Lutheran Seminary following being called to serve as pastor at Grace Lutheran Church in Kenai Alaska. Molly, Emma (our one year old daughter), and I and shipped our possessions via U-haul and flew ourselves up in early July. I was installed and ordained on July 15. Molly was also called to teach Kindergarten at Grace`s school. She gladly accepted. Molly really has a passion and gift for teaching. The current situation works quite well, Molly teaches in the morning while the principal`s wife watches Emma, then they come home at lunch for the rest of the day. We are expecting a new addition the family--Ava Louise is due to born on March 30! We are all overjoyed and eagerly wait for this blessing to arrive. I have joined some of the local historical societies and have been put on the board of the Soldotna Historical Society. It is a great way for me to connect and serve in my community while doing something I enjoy. We are constantly amazed at the wonders of God`s creation here in Alaska. On a clear day, we can see mountains on three sides. We live five miles from the Cook Inlet which connects to the Pacific Ocean. A warm Japanese current keeps the temperatures here very mild. We frequently see moose in our yard and have been able to see grizzly and black bears in the wild as well as puffins, whales, otters, and seals. Anyone looking for a vacation destination is encouraged to stay with us, or at least stop by and say hi. The ministry at Grace is one of great joy and opportunity. We have a little more than a hundred members in the congregation. The school has 64 students. Apart from Molly and myself, there are 4 other workers on staff. Our current principal has accepted a call and we ask for your prayers as we continue to call a replacement for him. We are the only WELS church on the Kenai Peninsula (which geographically is about 1/6 the size of Wisconsin). While most members live within a 15-20 mile radius, some members drive an hour and a half one way. We are currently pursuing an active Bible Information Class program and are witnessing God`s blessing of these efforts. This summer we will hold our soccer camp with help from Molly`s brother Joe, and students from Kettle Moraine Lutheran High School. 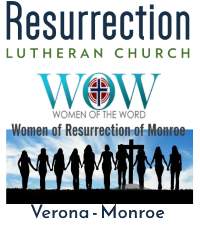 May God continue to bless each one of you and the ministry of Ressurection-Verona and Ressurection-Monroe!